Tonight, I was watching the late evening news, when I heard Mitt Romney say "Republicans, lead by John Mccain and Sarah Palin, will fight to preserve the values that have preserved the nation". Someone gag me please. I am sure those same "values" that Mitt Romney speaks of are the same ones that prevent me from getting married or might prevent me from adopting kids. I am sorry, but allowing me to get married, adopt kids, or any of these other so called "values" are in no way going to bring the demise of the nation as Romney would like you to believe. These types of politics in general make me sick (Democrat or Republican) and I do not think November 4th can come fast enough. I am already sick of this crap, lets just get this election over with. I still think my definition of politics is so true: "'Poli' a Latin word meaning 'many' and 'tics' meaning 'bloodsucking creatures'". 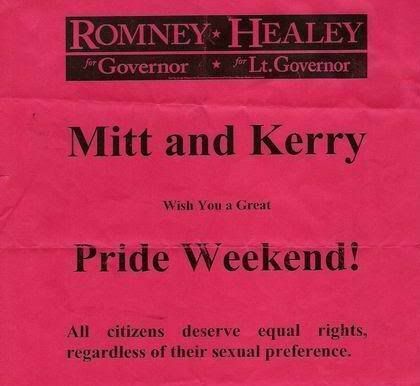 It's amazing how Mitt changed his tune on gay rights. He was pro-gay when he ran for Governor of MA, but when he ran for President, he became Mr. Values. I know, what is up with that? I know the republicans are big on these so called values, but you would think a man would stand by his conventions. Oh wait, thats right, its politics.